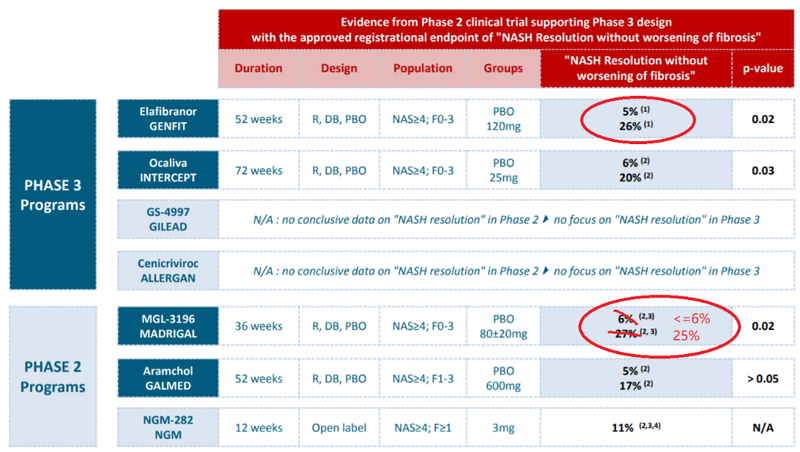 Although possessing huge market opportunities, there is currently no ideal NASH candidate in the late clinical stage. MGL-3196, based on its comprehensive measurements, large Phase II enrollment and clear signs of improvement in NASH symptoms, is currently out-competing its competitors. Criticisms driven by MGL-3196’s outcome in fibrosis stage improvement as well as “NAS point reduction” are over-stated. As the current leader and apotential strong candidate for solo / combination therapy, we think MDGL deserves a premium in price. Madrigal Pharmaceuticals (MDGL) is a US biotech company that currently has only one drug, MGL-3196, under clinical investigation stage. Being Madrigal’s key asset, MGL-3196 has proven its strong potential in Non-Alcoholic Steatohepatitis (NASH) and is currently advancing to Phase III. Non-Alcoholic Steatohepatitis (NASH) is a disease that affects a lot of people worldwide yet no FDA approved drug ever exists. It currently affects about 8% of the entire US population and is estimated to exceed a $20~30B market size in 2026 globally. It’s a more aggressive form of Non-Alcoholic Fatty Liver Disease (NAFLD) that exhibits liver inflammation and cell injury with fibrosis. NASH’s serious impact is usually underestimated by its asymptomatic nature. Without proper treatment, NASH is more likely to progress to cirrhosis and hepatocellular carcinoma which greatly increases mortality of the patients. According to the record from United Network for Organ Sharing (UNOS), NASH has overtaken HCV as the leading cause of liver transplantation in US. a) Numerous physiological indicators and nonuniform definition. NASH’s physiological indicators include liver steatosis, lipotoxicity, insulin resistance, inflammation, fibrosis, etc. The diversity of the indicators makes trial design more complex. One may see unusually long endpoint description like “at least 2 point reduction in NAS score while non-worsening in fibrosis for patients with fibrosis stage 3 or larger”. This is a good example to show that companies are trying their best to make the endpoint reasonably achievable under such a multi-indicator environment. Another example comes from the fact that different trials use different definitions of “NASH resolution”. This makes direct comparison between trials hard for investors. b) Hard to recruit patients and even harder to get measurement. NASH is asymptotic until very late stage, and it sometimes combines its presence with comorbidities like diabetes. Primary care physicians may not recognize the disease and its risk. As a result, recruiting NASH patients to trials have been historically hard. Further, the biggest difference between NASH and NAFLD, the liver fibrosis, is very hard to confirm diagnostically. The only way to recognized liver fibrosis is by liver biopsy under current standard of care. This invasive and expensive diagnostic process makes NASH data collection from patients in the trial even harder - imagine asking a patient for a second liver biopsy within three months. This even creates selection bias in the trial result: patients under the trial who show better resolution or even remission (demonstrated from other indicators) may likely to reject further biopsy request. Thus, it is reasonable to assume that, trial results with pathology scores from liver biopsy may be understated. c) The mechanism of NASH development is very complex and not fully understood. While there exist very effective medications for certain diseases whose mechanisms are poorly understood, unclear mechanism definitely reduces the success rate of the related clinical trials. It is believed that multiple complex mechanisms drive the development of NAFLD and NASH. For example, a well-accepted “two-hit hypothesis” was proposed as the mechanism of development of NASH, trigger by environmental factors (HBV/HCV infection, dietary habits, etc) as well as GWAS (genome-wide-association-study)- revealed genetic predisposition as revealed by a recent publication in Hepatol Int. [Eslam, 2016]. Although difficult, the huge market opportunity attracts numerous players. Gilead (GILD) is probably the most committed company that of one time, had five pipelines (solely owned or in collaboration) in NASH. However, strong commitments have yet turned to promising results. Two of its pipelines discontinued (Simtuzumab, Anti-Loxl2 Mab and Px-102, FXR agonist) and its fastest progressing Selonsertib (Ask1 inhibitor) just encountered a big hit in the failure of Stella-4 trial in Feb, 2019. Allergan (AGN)’s cenicriviroc ((CVC) )failed its Phase IIb primary endpoint (CENTOUR study) in mid 2017 but still advancing to Phase III (AURORA study) and collaborating for combos with Novartis. Other companies like Genfit, Madrigal, Viking (VKTX), NGMBio (NGM), Galmed (GLMD) all have their key NASH pipelines advancing (or close to advance) to Phase III, trying to grab a portion of the market share. Madrigal Pharmaceuticals Inc’s THR-β agonist (thyroid hormone receptor beta agonist) MGL-3196 is Madrigal’s key asset. Although detailed mechanisms still unclear, THR-β is thought to lower LDL-cholesterol, lower triglycerides, lower liver fat and potentially reducing lipotoxicity and NASH. It’s highly selective on THR-β comparing to THR-α, making it localize in liver, reducing its systematic side effects. 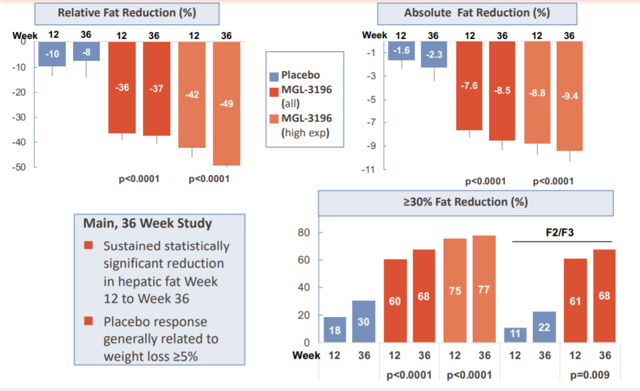 MGL-3196’s Phase II primary endpoint was relative reduction of liver fat (through MRI-PDFF) at 12/36 weeks. This primary endpoint is similar to Viking’s VK2809 (also a THR-β agonist) Phase II primary endpoint (reduction in LDL-cholesterol). In comparison, other competitor’s phase II primary endpoints, such as Intercept (ICPT)’s OCA (FXR ligand) or Genfit’s PPARα/δ agonist elafibranor (GOLDEN 505) trial, are more involved in NAS score [Fig. 1], NASH resolution or fibrosis. This may draw criticism since Madrigal’s primary endpoint is more likely to be associated with NAFLD trials rather than NASH trials. Further, reducing liver fat is probably an easier endpoint to reach (simply losing body weight can reduce liver fat) comparing to other direct-NASH-related endpoints. However we think it is actually a smart move: a) after so many trial failures, Madrigal took one step back and recognized that NASH is a special form of NAFLD and proper treatment cannot ignore its disease origination; b) it does have direct-NASH-related secondary endpoints, which will be discussed later in this article. At 12 weeks of treatment, the relative fat reduction (comparing to placebo) is 26%, the absolute fat reduction is 6% (Fig.2). These numbers are not as significant as Viking’s 47%/ 8%. 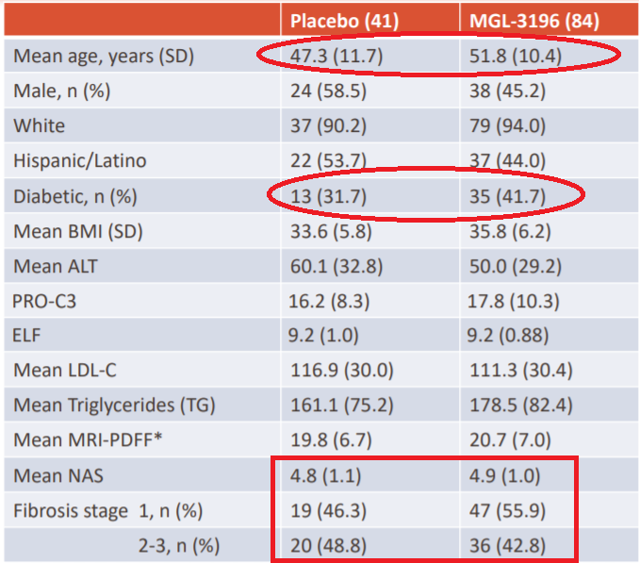 At 12 weeks, the relative percentage of responders (with a 30% liver fat reduction or more) to MGL-3196 is 42%, which is also lower than Viking’s 59%. We argue that it is too early to draw the conclusion that VK2809 is a better liver fat reducer. First, MGL-3196 recruited much more patients in Phase II (150 vs. 35 for Viking), making results more reliable. Second, MGL-3196 clearly shows a continuous improvement, from week 12 to week 36 but VK2809 does not show such trend. The LDL-cholesterol reduction (22% vs. Viking’s 24%), apolipoprotein B reduction (22% vs. Viking’s 23%), lipoprotein A reduction (37% vs Viking’s 26%, however Madrigal exclude BL<10mg/dL so original number should be smaller) are all very similar in both trials, suggesting similar mechanisms on THR-β agonists. As just mentioned above, neither did Intercept’s OCA trial nor Genfit’s Elafibranor put great amount of emphasis on liver fat reduction. Elafibranor is capable of reducing total cholesterol as well as LDL-cholesterol, while in a recent publication in World J Gastroenterol that OCA was found to actually increase serum LDL-cholesterol [Makri, 2016]. Figure 2. The liver fat reduction on MGL-3196. Source: Madrigal’s website. The liver enzyme levels indicate the functionality of the liver. 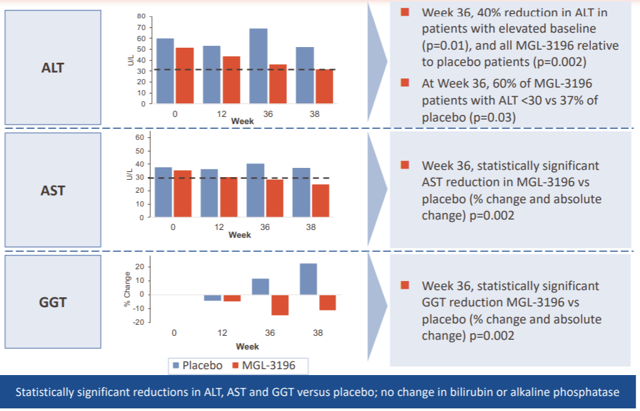 MGL-3196 successfully reduces ALT, AST and GGT and clearly shows a continuous enhancement of liver function even after 12 weeks [Fig. 3]. Vk2809 does not show the data but mentioned such reduction in the memo, with some AEs showing elevated ALT and AST. In a recent publication in Gastroenterology, researchers demonstrated that Elafibranor shows clear reductions in ALT and GGT as well [Ratziu, 2016]. Intercept’s OCA from the most recent data coming out on April.11th, 2019, shows an stabilized liver enzymes too. Figure 3. MGL-3196’s impact on liver enzymes. Source: Madrigal’s website. The main outcome of MGL-3196 is the liver biopsy endpoint showing in Figure 4. The NASH resolution is 27% vs. 6% in placebo for all patients. The industry is interested more in NASH resolution without fibrosis worsening. Genfit summarized a head-to-head comparison between Intercept’s OCA, their own Elafibranor and Madrigal’s MGL-3196 (Fig. 5). At that time, the NASH resolution with no fibrosis worsening data for MGL-3196 was not disclosed. 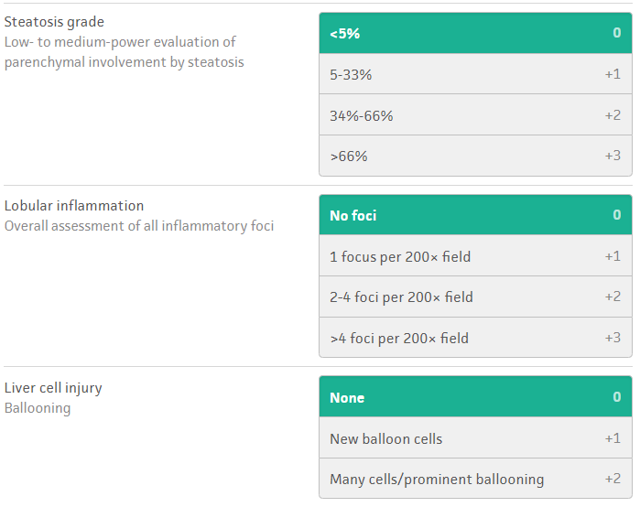 So Genfit put the 27% number and mentioned that its for all patients. Now we have that missing piece of information, and we can replace the 27% with the more proper 25%. We still miss the placebo number with no worsening in fibrosis, but it should be smaller than 6%. It is clear that MGL-3196 has a comparable efficacy to elafibranor on this endpoint, and is clearly better than Intercept’s OCA. VK2809 on the other hand, didn’t touch too deep in biopsy-related outcome in its Phase II trial, which is one of the major reasons that its pipeline evaluation is far less than Madrigal. Figure 4. Liver biopsy endpoint. Source: Madrigal’s website. Figure.5 Head-to-head comparison with other NASH trials on “NASH Resolution without worsening of fibrosis”. Source: Genfit’s website. The result for “2-pt NAS reduction with at least 1pt reduction in ballooning or inflammation” probably is one of the main reasons that Madrigal’s stock price got punished so far. It shows no statistically significant difference to the placebo. Madrigal tried to save it by saying that a lot of the patients in placebo reduced more than 5% of their body weight. It compared under the sub-group of <5% body weight reduction and improved the significance. This statement would be more convincing if MGL-3196 can be proven to not reduce body weight. In fact, a lot of NASH candidate drugs are meant to reduce body weight. In a recent publication that OCA appears to slightly reduce body weight [Makri 2016]. In another recent publication in World J Gastroenterol, Liraglutide and Elafibranor are both effective in reducing body weight in NASH mouse models [Tølbøl, 2018]. From Fig. 4, we see a lot of placebo patients get 2pt reduction in NAS but very few placebo patients achieve 0 and 0/1 in ballooning and inflammation. This tells us that more placebo patients who get 2pt reduction in NAS get their decrease from steatosis, which is the most easy-resolving aspect. It is not surprising that, if placebo patients get more weight loss, they do show a better steatosis improvement, which in turn lead to good NAS reduction. Other possible reasons may due to the age distribution and diabetic percentage difference. The fibrosis stage improvement probably is another indicator that investors don’t like. 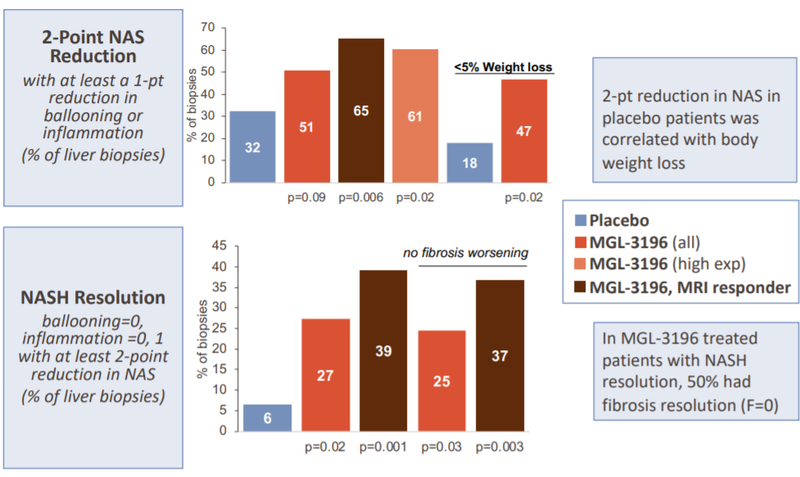 The pathological score only shows that 29% of patients treated with MGL-3196 reduces at least 1 point in fibrosis vs. 23% in placebo. Madrigal changed the method of measurement and used Second Harmonic Generation Microscopy (SHG) to show a more significant difference. In comparison, Intercept’s OCA shows a much prominent difference in overall fibrosis improvement using pathological scores (35% in OCA vs. 19% in placebo). Allergan’s CVC trial was designed to improve the fibrosis reduction efficacy but it failed to show a significant difference vs. placebo. However, Allergan’s detailed analysis on fibrosis scores in the sub-population of each arm does provide several meaningful insights. The most important one probably is, Allergan found out that fibrosis score is a very dynamic indicator, even in placebo patients [Fig. 8]. In the Allergan’s CENTAUR trial, more than half of the placebo patients changed their fibrosis score in a year and 20% of the placebo patients experience an improvement, either in year 1 or year 2. If such indicator is so volatile in placebo (larger standard deviation of change), it is indeed very hard to see a statistically significant improvement in treatment group (if the difference in mean of two groups is much smaller than standard deviation of the two groups, the resulted p-value in t-test will be much larger, i.e. statistically insignificant). Moreover, because fibrosis score is just a 5 stage categorical variable, such large volatility make it extremely hard to show statistically significant result. Figure 8. How fibrosis stage changes in placebo arm in Centaur trial. Source: Allergan’s website. We think this implies that, because of its instability, fibrosis score is not a reliable indicator for measuring NASH improvement, probably not ideal to be trial’s primary endpoint. Further, fibrosis is a continuous variable that should not be described just by 5 discrete stages. This actually makes Madrigal’s SHG measurement, and other trials using fibrosis biomarkers look more reasonable: using continuous SHG score or biomarkers level rather than 5-stage pathological scores from biopsy not only shows better results but actually make more sense. The treatment-related AEs for MGL-3196 seems not a big issue. All 7 SAEs are non-related and other AEs are mostly mild. a) MGL-3196 has good liver lipid reducing efficacy and continuously improves liver enzyme levels. It out-competes Intercept’s OCA, Genfit’s elafibranor and Allergan’s CVC in these two aspects. 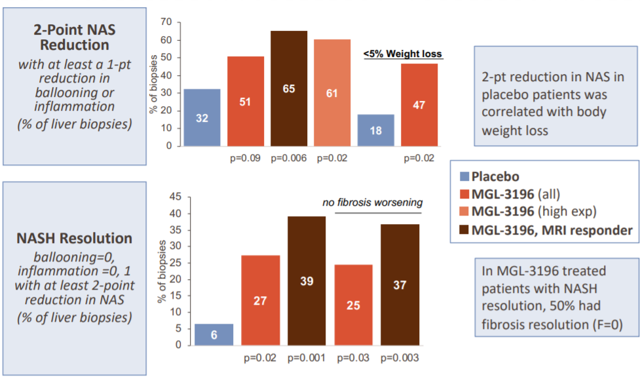 b) MGL-3196 currently is one of the two best “NASH resolution without worsening in fibrosis” medications in the industry, co-lead with Elafibranor and out-competing VK2809. c) It’s moderate outcome of “NAS point reduction” may due to the large steatosis score reduction in placebo, which is easy to improve comparing to ballooning and inflammation. It’s moderate outcome of fibrosis stage improvement is not a big concern either because it is a unreliable indicator itself. d) VK2809 does not have biopsy data yet, so with current evidence, there is no way that VK2809 can compete with MGL-3196. Besides, VK2809 has an earlier patent expiration of 2024, which greatly reduces its potential. NGMBio’s NGM282 is the same, no biopsy data, too early. e) OCA just showed results with no significant efficacy in "NASH resolution with no worsening in fibrosis" on newest data April.11th. Further, OCA significantly increases patients' LDL-cholesterol. We think OCA is clearly an underdog. f) Galmed’s Aramcol’s phase IIb exclude patients with 5% weight reduction in 6 months, that is “cheating”. Even with that, neither of its NASH resolution with no fibrosis worsening nor its fibrosis improvement without NAS worsening showed significant difference to placebo, a total failure. g) Elafibranor is currently the remaining rival. Its physiological outcome is similar to MGL-3196. It fails on its Phase II primary endpoint in “2pt reduction in NAS”, which MGL-3196 failed on it too, but MGL-3196 has better liver fat reduction. h) Based on current evidence, we think MGL-3196 current is one of the best, if not the best NASH improving candidate in the industry. Currently, there are a lot of NASH targeting medication under investigation and no single agent has shown dominating outcomes. Researchers believe that combination therapy may be the future direction. Being fairly new and having a good safety profile, THR-β agonist is potentially a very good candidate for combo therapy as well. Since June 2018, the Madrigal’s stock price has retrieved more than 50%. Given the current evaluation of under $2B, we think Madrigal now shows attractive pricing. Once commercialized, Madrigal’s market cap will probably go beyond $6B. Given current evidence, we would like to assign a 65% chance for final approval, which gives a $4B fair value in two years. Further discounting using 15% WACC for two years, we get a $3B current valuation, which indicates a 50% upside potential. By the end of 2018, Madrigal has $480M cash and short-term investments in hand. It currently burns $6~7M per quarter from operating activities. Since it is advancing to Phase III, we would assume the cash burn rate could go to $40M~$50M per quarter. Thanks to Madrigal’s SPO in Q2 2018, we think its current cash is enough to complete its Phase III trial. Based on the transparency of the trial and the comprehensive outcome measurement, MGL-3196’s physiological impact profile is pretty clear. Its Phase III trial is unlikely to come up with unexpected result in liver fat reduction, liver enzyme reduction, etc. We think there is little reason for MDGL’s stock price to fall further (unless systematic collapse of the entire market). Given limited downside risk and 50% price upside target, we think MDGL is a convincing buy. Hepatol Int. 2016 May;10(3):394-406. doi: 10.1007/s12072-015-9689-y. Epub 2015 Dec 18. Genetic and epigenetic mechanisms of NASH. World J Gastroenterol. 2016 Nov 7; 22(41): 9039–9043. World J Gastroenterol. 2018 Jan 14; 24(2): 179–194. Kirstine S Tølbøl, et al. Disclosure: I am/we are long MDGL. I wrote this article myself, and it expresses my own opinions. I am not receiving compensation for it. I have no business relationship with any company whose stock is mentioned in this article. Additional disclosure: Investors are always reminded that before making any investment, you should do your own proper due diligence on any name directly or indirectly mentioned in this article. Investors should also consider seeking advice from a broker or financial adviser before making any investment decisions. Any information mentioned in this article was not verified, and should not be relied on as a formal investment justification. All recommendations and other statements, unless specified, are based on author's personal understanding / judgement and may subject to future changes.